Sea of Thieves is significant not only because it marks the first major release from developer Rare in a very long time, but also because it represents a big departure from the type of design choices that have dominated both multiplayer and open-world games for the last decade. 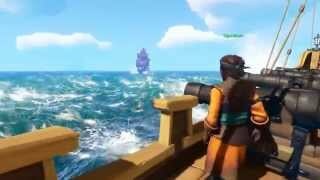 A multiplayer pirate game with both co-operative and PvP elements that asks you to play simply for the fun of playing, Sea of Thieves feels undeniably fresh and unique, especially in its early hours when learning and discovering the different mechanics with the vast island-dotted ocean map seeming to contain endless possibilities of adventure. Unfortunately, in its current state the possibilities end up being a bit more limited than they first seem. One of the biggest surprises players are in for when first launching the game is the lack of any kind of real tutorial. 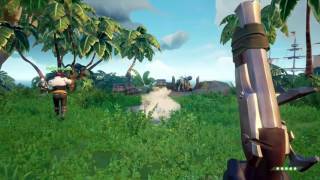 After choosing from a selection of rather angular randomly-generated pirates, you will be plopped into an outpost in the sizeable open world with only a handful of tips on how to use some inventory items and a vague indication that you should take on some voyages to earn gold and reputation. The initial lack of a tutorial may cause some frustration, like the game not clearly indicating how to buy or start voyages. However once you get a voyage underway, the initial learning and experimentation phase ends up being one of the most enjoyable parts of the game, especially if you go through it with some friends. Once you and your crew decide on a voyage, you gain access to a map or contract indicating where you need to go. Unlike most quest-based open world games, instead of simply following a waypoint to this location, you must use a map located on the ship to find your destination either from the island name, or looking at its distinct shape on a treasure map, and plot a course to it. The most fun might be had in learning to sail, especially if part of a four-person crew on the Galleon, the larger of the two ships available in the game. Helming the ship is a significant challenge as it is appropriately slow to respond when steering, and the helmsman will often be unable to see past the large sails, relying entirely on crew-mates to indicate if they are on course or destined to crash into any obstacles, forcing other crew members to repair any ensuing leaks and bail out water. If you want to maintain any reasonable speed, it is necessary to adjust the sails so that they are filled by the wind, which is represented by subtle white lines moving above your ship. Once your ship is on course and the sails are adjusted correctly, there are some fun distractions to help pass the time, like playing an instrument and drinking grog. If multiple players play their instruments at the same time, they will sync up and harmonize which is a nice touch. Inversely, drinking too much grog and playing your instrument will result in your playing it badly and out of tune. Drinking also causes your character to stumble around and struggle with basic actions, making for some comical moments where someone on your crew might fall off the ship or become unable to steer properly and crash into a rock. Of course, you can always vote a crew member into the brig for bad behavior. What you need to do when you get to your destination will be determined by the type of voyage you chose to complete. There are three factions in Sea of Thieves that sell you voyages; the Gold Hoarders, Merchants Guild and the Order of Souls. The Gold Hoarders voyages are easily the best, involving following treasure maps or pirate riddles to unearth chests with a satisfying clunk indicating you have dug in the right spot. The Merchants guild quests involve going between different islands looking for specific animals which you must capture with cages and transport to another outpost, while the Order of Souls voyages involve going to islands to kill skeleton crews using the very simplistic ranged or melee combat, taking the skulls of skeleton captains back to outposts as proof of their deaths. Though all of this is fine and well for initial adventures, the first signs of trouble start to cloud the horizon when it becomes apparent how little variety there is in the voyages. With the Merchants and Souls factions in particular, once you have seen a couple of voyages, you have pretty much seen them all. Though you can gain access to higher level voyages by increasing your reputation with each faction, the actual mechanical progression is minimal. For the merchants, you will start to capture pigs who require feeding or snakes that will poison you, but these are minor variations on what essentially involves sailing between islands, capturing animals, and transferring them to another outpost. The Order of Souls contracts are perhaps even more repetitive; higher level quests typically just involve fighting larger numbers of skeletons with a few small twists like metal-plated skeletons who you can weaken by throwing water on them, or skeletons that require lantern light to be fully seen. Each of the factions let you increase your reputation level up to fifty, but I felt completely burned out on the Merchant and Order of Souls voyages by the time I reached level fifteen, with the unique and sometimes challenging riddles of the Gold Hoarder missions holding my interest a bit longer. Working your way through these factions' voyages appears to be the meat of the Sea of Thieves experience, and sadly there just isn’t enough variety or substance to them to provide consistently compelling gameplay. Each outpost has a Tavern with a mysterious individual encouraging you to increase your reputation with each faction, but when you reach a milestone specified by this individual such as reaching level 5 with each faction, they will simply tell you to try and reach level 10 and so-on. Fortunately, the game has a few more tricks up its sleeve to keep you distracted from the repetitive voyages. Messages in bottles can be found on beaches and contain unique treasure maps and contracts. Shipwrecks are scattered around the ocean and can be explored for treasure and supplies. Storms move around the map, and getting caught in one requires the crew to bail rain-water out of the ship while the helmsman must constantly fight the wind and a spinning compass to stay on course. A giant cloud in the shape of a skull might appear, denoting an island that can be raided which involves killing waves of skeletons with the eventual reward of a huge haul of treasure. There is even a Kraken who might appear and attack your ship with giant tentacles, which can be scared off by firing cannons at it. The biggest and most important variable however is the presence of other players who might try and sink your ship and steal anything of value you have on board, unless of course you decide to do the same first. The biggest factor determining your tactics in a hostile encounter with other players is the type of ship you are on. Playing by yourself or with one friend will see you piloting the smaller sloop, which has only one cannon on each side and takes less time to sink, but is much more maneuverable than the large three or four-person crew Galleon. You can fire yourself and crew-mates out of cannons onto enemy ships, or jump overboard with explosive barrels in an attempt to blast holes in their hull. Once a ship is sunk, any treasure on board will float to the surface. Ships are totally disposable, disappearing when you leave the game, so your attachment to a vessel is determined only by how much treasure you have on board. Encounters with other players in Sea of Thieves easily constituted my favorite parts of the game, and it will be a while before I forget the time I escaped defeat in a three-way battle by steering into a nearby storm, or managed as a solo player to sink an enemy ship by jumping into the sea and climbing on board their unguarded vessel when they were busy searching my abandoned sloop for treasure. One wrinkle in the otherwise highly entertaining ship battles is that you always respawn back on your ship unless it sinks or you scuttle it, meaning hostile pirates can simply wait on your ship until you spawn only to kill you immediately. It is also worth noting that servers are sparsely populated, meaning you can play for hours without getting into any encounters with other players. The most surprising thing for many players might be the fact that character progression in the game is exclusively cosmetic. Gold you earn from voyages and treasure can be used to buy new clothing, weapon and equipment skins and if you save up enough, cosmetic changes for your ship. Functionally, the gear you have when you load up the game for the first time will be the same gear you have for the duration of your time with it. There are only a handful of weapons and a single type of ship-cannon, which definitely left me wanting. The upside to this is that everyone is on a completely level playing field, meaning newcomers won’t need to worry about getting entangled with higher level ships sporting objectively better gear. The downside is that between the lack of voyage variety and character progression, I suspect without anything tangible to work towards, many players will fall off the game rather quickly. One thing that did keep me coming back to the game is that it looks absolutely breathtaking. The cell-shaded, stylized visuals bring to mind Disney Pixar films, with the beautiful and dynamic ocean in combination with excellent ever-changing lighting being the real stars of the show. Ships and debris bob up and down convincingly in the waves and a slick, non-intrusive UI really help immerse you in the experience. The audio is almost as good, with sparse but well used music setting the tone for battles or more peaceful moments of sailing across the sea. Your ship will creak and groan as you change course or adjust the sails, and you will feel the full fury of storms as they deafeningly blow through. 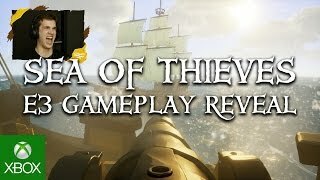 In its current state, I found Sea of Thieves to be refreshing, immersive and initially very compelling. It is a great foundation for multiplayer pirate game, but it’s just that, a foundation. The lack of voyage variety in combination with a purely cosmetic progression system mean you must rely on emergent gameplay encounters with other players to keep things interesting, but these are infrequent enough that they cannot be relied upon to provide consistent entertainment. For the hefty asking price of sixty dollars, I’d struggle to recommend the game in its current state, but if Rare add more varied content and find ways to increase the frequency and variety of emergent gameplay encounters it could easily grow into something a bit more sea-worthy. The cell-shaded art style in combination with excellent water tech and dynamic weather and lighting allow for frequent moments of profound beauty. Audio design is also very good, as is the original soundtrack and player instrument driven tunes. Sailing and battles with other ships are compelling and original co-operative activities, but the voyages themselves are extremely repetitive and combat mechanics are very simplistic with progression limited to cosmetic items. Though you can crew a small ship by yourself, you are forced to play in a instance with other players and cannot play the game if the Sea of Thieves servers are down. Though Sea of Thieves is most fun with friends and some gameplay mechanics support this, interactions with other crews are infrequent and some functionality like having friends join you on voyages in progress is handled clumsily. Launch server issues appear to have been resolved aside from some minor rubber-banding here and there, with good in-game performance. Initial load times when getting into the game can be lengthy.